I worry about the ideas of “influence” and “icon” which so pervade popular art history today. Two new exhibitions, one built around Piero della Francesca and the other around Giorgione, bring these issues directly into the open. And on two very different Cognoscenti tours this year we will try to cut through to the actual world of these great artists – we will be visiting the countryside of both, indeed visiting the birthplace of both, and we will see masterpieces in the setting for which they were painted. Art history exists to offer us lenses through which to view the world of great paintings or sculptures. We may see more clearly through these lenses, but they will always to some extent be distorting, and they can change focus with seemingly arbitrarily changing fashion. I believe art historians are most useful when they help explain the formation of a work and the world wherein it could be made, with the varied actors and the tools available to them – from beliefs and symbolic gestures to pigments and hammers. But art historians have most influence on our experience, rather differently, in what they choose to focus on, what they neglect, and what they group together. The intriguing exhibition ‘Piero della Francesca: Exploring a Legend’ which has now opened near Bologna, shows just that. And it raises again the two worries I have – around “icon” and “influence.” ‘The Age of Giorgione,’ at The Royal Academy in London shows a rather different approach to similar curatorial issues. “Icon” makes me shiver particularly, as a large book I wrote on Charles Rennie Mackintosh many years ago had the word “icon” in its title, against my wishes but with a publisher convinced the word brought sales. Piero della Francesca attracts such superlatives and perhaps visitors to this exhibition, though the word is equally meaningless – since “legend” he surely is not. His remaining works, particularly moveable ones, are few; and here parallels begin to appear with the slightly later Veneto painter, Giorgione. Both are called enigmatic, both left work whose subject matter is far from simply explicable. “The Enigma of Piero” (by Carlo Ginsburg) I referred to in this post); “The Enigma of Giorgione” (by Ali Smith) is referred to (Cognoscenti post 68) and can be read in full (in The Guardian archive). “Excessive iconomania has been one of the banes of art history for the last two decades,” lamented a critic years ago, when reviewing Marilyn Aronberg Lavin’s book about Piero’s Flagellation (its cover seen above). “Influence” worries me rather differently; it can tend to diminish artists, focusing on what they took from, rather than how they built on others, and it can also privilege the art historian’s skill over our focus on the actual works. With each of these shows there is only a handful of works by the “icon,” the painter who appears in large bold lettering on the posters. So how do they build into a satisfactory exhibition? The Piero show has over 150 works, but just three by Piero, two being his (minor) saints shown above. There are ‘contemporary’ works from Giovanni Bellini and Antonello, Veneziano and Beato Angelico. There is, for example, the bust seen below of Battista Sforza, she who was painted by Piero as in my post (Cognoscenti 115). In this exhibition there are lots of copies of Pieros, mainly of the Arezzo fresco cycle. But the main sense of “influence” is in the inclusion of Seurat and Degas, Carra and Morandi, even Balthus, Duncan Grant and Hopper. Unexpected juxtapositions are often fascinating, but this show must appear strange to a devotee of Hopper; or indeed of Piero. One of our American travellers to The World of Piero in September has kindly pointed out a long and interesting review in The Wall Street Journal this week. The Royal Academy, on the other hand, sticks entirely in the age of Giorgione, the shortly-lived painter of whom so little is known. And it offers wonderful pictures whose attribution has swilled around, keeping the historians in business, but whose actual qualities never change. Does it matter whether the young nobleman above is by the hand of Giorgione or of Titian? Finally a word on two amazing altarpieces. The extraordinary, original composition (above centre) is one of very few works verifiably by Giorgione. It is not in the exhibition – but it will be visited by our Cognoscenti Terraferma tour in June, in Giorgione’s home town of Castelfranco. 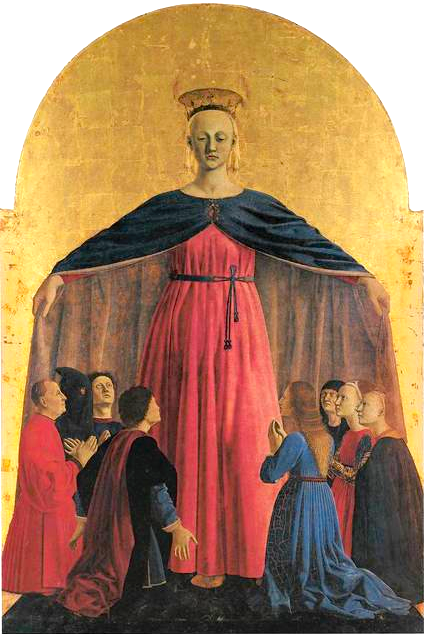 The highlight of the ‘Piero Legend’ exhibition – indeed the only ‘Piero’ reason to visit – is his magnificent, unique Madonna della Misericordia (below). This also will be visited by our Piero tour in September, for by then we are promised it will be back in Piero’s home town of Borgo Sansepolcro, whither it returns to become once more the central panel of a great polyptych.